For the Stockton Heat, the storm has hit. At the Christmas break, the Flames American Hockey League affiliate had played only 22 games. That was the fewest of all 30 teams. But the calm that had been the first two-and-a-half months of the AHL season ended Saturday night when Stockton began a hectic stretch of eight games in 14 days. During the handful of days off the team had for the holidays, I had the opportunity to catch up with Stockton head coach Ryan Huska and get his assessment on how a few of Calgary's top prospects are faring. 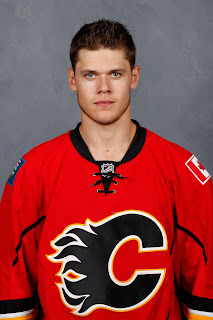 In the off-season, trades, free agent signings and the 2015 NHL Draft collaborated to improve the depth on the Flames blueline. 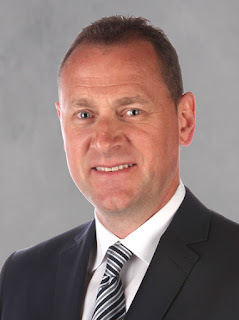 As you'll recall, this was an area general manager Brad Treliving had identified going into last summer as an organizational weakness he wanted to address. 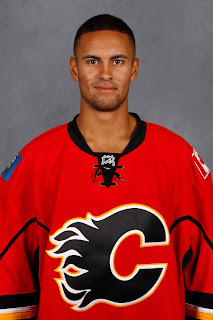 Keegan Kanzig - Was scratched five of six games before being returned to the Calgary Hitmen (WHL). 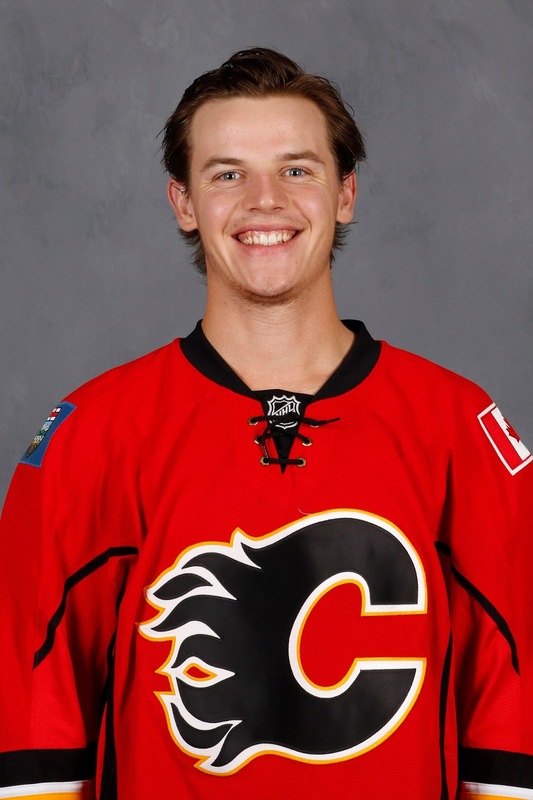 Ladislav Smid - Appeared in one game during a brief conditioning stint before returning to the Flames. Ryan Culkin - After his gruesome season-ending wrist injury last February, he suffered another major injury when he hurt his shoulder in September at the rookie tournament. When finally healthy in mid-November, Culkin was assigned to Adirondack (ECHL) where he remains. With Aaron Johnson, the veteran of over 700 AHL games, loaned to Canada's team at the Spengler Cup for the next couple weeks, that leaves the Heat with seven healthy defencemen. While losing a team leader like Johnson -- Stockton's captain -- is never a good thing. It's also not necessarily a bad thing for Huska, forced to deal with having too many defencemen on the roster during both his seasons in the AHL. 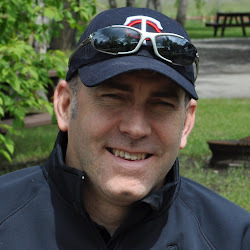 "Hockey Canada wanted Aaron for the Spengler and it is such a terrific experience. We are excited for him about this cool opportunity," Huska said. "This will allow the other seven defencemen a little more playing time although Aaron was often the guy that was out of our line-up. "We are busy after Christmas so we will really need to lean on the seven guys we currently have to play a lot of hockey in a short period of time." 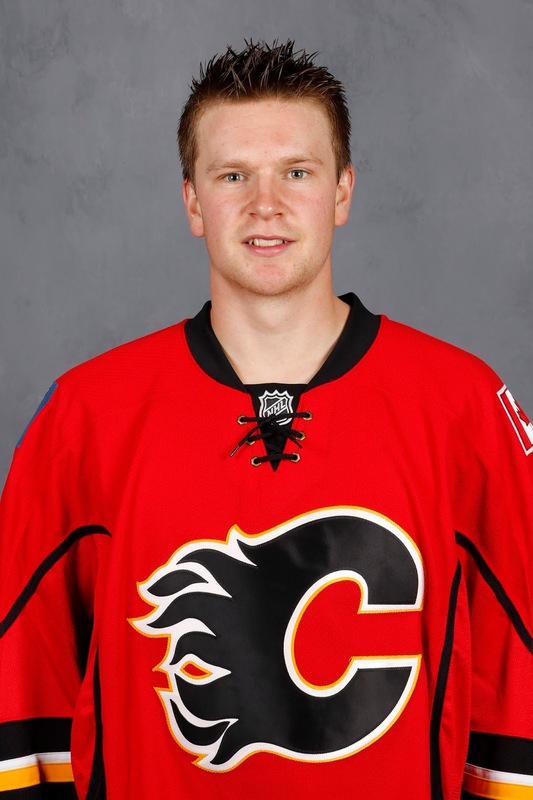 Brett Kulak was the Cinderella story of training camp when he came from well off the radar to make Calgary's season-opening roster. He played alright too before Ladislav Smid's return, more than his own performance, squeezed him out of his NHL job. "Brett did a great job over the summer getting himself ready to get into a position to earn a spot on their opening roster and he was there for quite a while so there is some disappointment that comes with being sent down and that's something you can't deny," said Huska. "He went through a stretch when he first got sent down that his first couple games weren't the greatest but I've come to understand that usually when guys do get sent down, it takes a little bit of time to get their feet underneath them again." Kulak has been used in all situations -- power plays, penalty kills and tons of five-on-five. Huska says consistency is what he needs to work on. "He's had a stretch where we felt he's played very well and he's had a few nights too where he's trying to force things a little bit too much. The challenge for all players and Brett included is to make sure that they're doing everything every day on the ice to be consistent with their effort so when there is an injury or if there is a situation where Calgary needs someone, he's the first guy on the list." Huska points out that the one thing you always get from Kulak is hard work. "Brett's a very diligent guy. He works out very hard. He's always the first guy at the rink, he's always the last guy to leave, he was the same way last year. He's committed. He wants to play in the NHL." 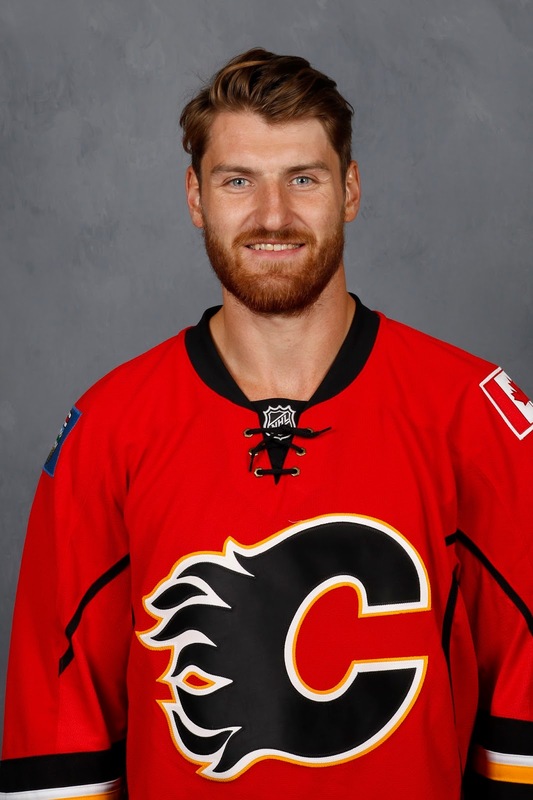 Jakub Nakladal demonstrated his upstanding attitude in the summer when he was invited to development camp more to meet the Flames coaching staff and other personnel but he insisted on skating at each one of the ice times also. "Personality-wise, character-wise, he's awesome," says Huska. "He fits in really well with our whole group. He works very hard every time he steps on the ice." When you leave the KHL to come to North America, the dream isn't to play in the AHL. Then when he did get a brief call-up to the NHL in October, he never got into a single game. Yet he has kept his head high and his exemplary attitude off the ice goes nicely with his all-round skill set on it. "He's been a breath of fresh air. When you look at a European, older player coming over, you're not sure what you're going to get but this young man is a terrific person," Huska says. One area the 27-year-old has excelled in yet wasn't an area the Flames realized was such a strength when signing him has been the man advantage. "He's one of the main guys on the power play and we're trying to put him in a spot where he can use his shot a little bit more often because he has cannon of a shot." Nakladal leads all defencemen with 50 shots, which included nine in one game a couple weeks ago. "He's played a long time in professional hockey in a very good league in the KHL and you can tell. He's got composure on the ice, he's confident on the ice, he's a good player," says Huska. The second-oldest defencemen on the team, his defence partner the last few weeks has been the youngest player on the team in 18-year-old Oliver Kylington. Leading up to the 2015 NHL Draft, Sweden's Oliver Kylington was once projected to be a top-five draft pick. Instead, he slipped all the way to 60th. His greatest attributes are his NHL-calibre skating and offensive abilities. Huska says those skills are very much still on display and it's not uncommon to see Kylington deep in the offensize zone. "You enjoy watching him play. He has that offensive confidence where he's got the feeling that he can create some offence for our group and be a difference on that side of his game," said Huska. It's his defensive game that remains a work in progress although Huska notes that there has been progress. "That's something he's going to have to work on for years, but we have seen him take steps in that department," said Huska. "He's typically been a guy that's really running our first power play for the most part and he's been getting bigger minutes five-on-five. For an 18-year-old to be able to do that, it shows a lot about how far he's come in a short period of time." A decision the organization faced in training camp was whether to assign Kylington to the AHL or to Brandon in the WHL, who drafted his rights in the CHL Import Draft. Huska says that so far, he can't disgree with the path the team chose. "If a player can handle it here, age shouldn't come into play," Huska says. "He showed early on that he's able skate here and his hockey sense allows him to get out of trouble from time to time." Not an overly thick guy despite some moderate weight gain this season, Huska says Kylington has a knack for avoiding the big crunches. "Even being a younger guy playing against bigger, heavier men, he's got the smarts to know where to put his body so he's not taking any big hits. I can't count too many occasions where he's been hit hard." When describing Tyler Wotherspoon, Huska goes back to that same word he used with Kulak. "He's had a little inconsistency in his play," Huska says. "But that was more in the beginning portion of the season and whether or not that had to do with not being up at the beginning of the year, I'm not sure." No doubt it weighed on his mind a bit. After getting in 14 games at the end of the 2013-14 season, bigger things were expected from the 2011 second round draft pick. 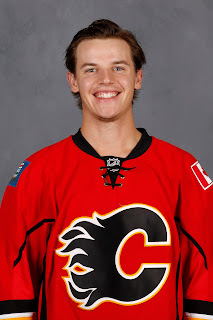 Instead, last year was rife with disappointment for the young man, who was recalled multiple times by the Flames but only got into one regular season game. While some discouraged fans are wanting to dismiss him, his 130 career AHL games is still equal to less than two full seasons and there are plenty of NHL defence regulars that played a lot longer in the AHL before arriving for good in the NHL. Also, don't forget that he played six playoff games last year. While he didn't play a lot of minutes, suiting up for six games is indicative that he's still in the organization's plans. "When he's 'engaged' I guess I can say, he's sharp with his details. When he moves the puck quickly, he's a very good defenceman and we've seen that out of him over the last number of games here," says Huska. Engagement is an interesting choice of words considering Wotherspoon literally just got engaged over the Christmas break. As a young man smitten over a young lady in his life, it's not a stretch to think that this can be a distraction. You wonder if one doesn't see further improvement in his play as the games get going again now that the ring is on her finger and no longer in his pocket. Wotherspoon has been paired up recently with steady veteran Dustin Stevenson. "If you look at his play now, he's been real consistent with his effort and he's defending well and at the end of the day, that's what you need out of him. To be a guy that you can trust on the ice in critical situations to play against top lines and he's done that for us over the last little while." The prospect most impacted by the excess number of bodies on defence has been Kenney Morrison, the free agent signing from last March. Contributing to the reason he's been scratched 13 times was a lackluster September. "Kenney, unfortunately, has been one of the guys that's been hit the hardest when you look at the numbers situation," says Huska. "A lot of that has to do with him having a little bit of a slower start than he would have liked right from our camp in Penticton through training camp." Huska is looking for the first-year pro, who played three NCAA seasons for Andy Murray at Western Michigan, to get himself more involved. "His big challenge is to make sure that he's really engaged and prepared to play a little bit harder so he's a tougher guy to play against. Once you see that, then I think the offence and the ability that he does have -- his ability to shoot the puck, his ability to move it quickly, will come out a little bit more regularly," says Huska. Johnson's temporary departure should result in more playing time for Morrison. Combined with the club's busy schedule and the 23-year-old's best chance to get in a groove is coming right up. 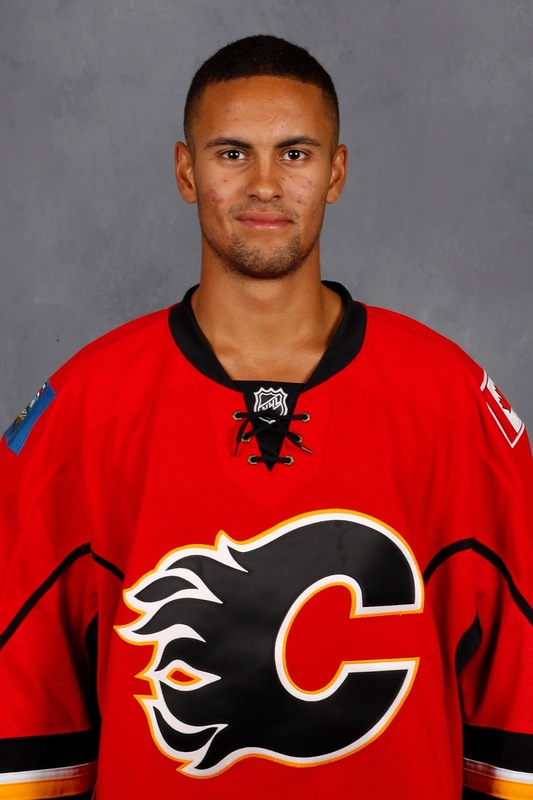 You know he's got talent as he was sought after by multiple NHL teams when he chose to leave school and sign with Calgary after three NCAA seasons. Huska is not a grizzled, longtime AHL coach. Having spent his coaching career in the WHL with Kelowna before jumping to the AHL last season, he admits his job is different now compared to when he was only coaching kids. He says part of the challenge is finding different ways to keep players spirits up and get them to play their best. "It's all part of the learning experience for me, for sure. It is a challenge but you have to find different ways to get to them because sometimes there are stretches where they get down on themselves a little bit," Huska says. "The AHL is a great league but let's face it, it's not where the guys want to be. They want to be playing in the NHL. So really getting them to understand their strengths and how they have to bring a little bit more to the table in order to get themselves that opportunity, that's my job." There hasn't been much opportunity in Calgary this season. But with Kris Russell a pending UFA, a trade over the next two months involving him is certainly possible. You also never know when injuries will strike either. Given their commitment to blocking shots, the Flames could suddenly lose a couple blueliners in the span of a week. When that next call-up happens, you want to be the prospect that is playing the best because it's often that, and not your credentials, that will get you that visit to the coaches office and a plane ticket to Calgary.